High diffraction efficiency and environmental durability are trademark attributes of the VPH transmission grating. 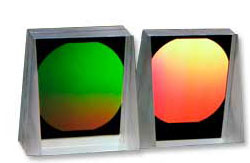 Given a VPH grating's low scatter, smooth spectral response, and wavelength tunability, along with more than twenty years of experience in the design and production of high quality holographic optics and you know why professional astronomers turn to Kaiser when requirements are the most demanding. Transmission VPH gratings offer another unique advantage referred to as the Super Blaze. Adjusting the grating angle with respect to the incident light causes a shift in the peak wavelength response. This means a single grating can offer very high diffraction efficiency over a wider range of wavelengths just by changing the angle of incidence of the incident light. Spectrographs optimized to take advantage of this feature can have a lower overall cost by reducing the number of gratings in inventory and less downtime to exchange gratings while improving overall spectral throughput. Kaiser designs and manufactures custom VPH gratings and grisms at our Ann Arbor facility. 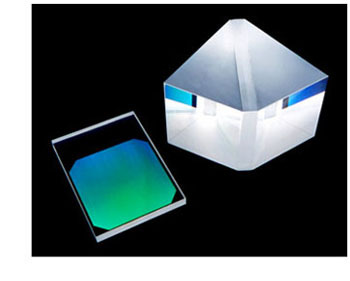 Kaiser offers more than 25 calender-years of experience designing and fabricating high quality holographic optics.